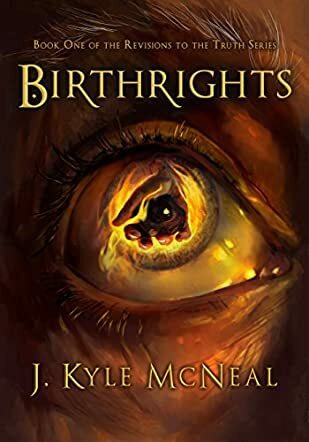 Birthrights is Book One of the Revisions to the Truth Series by J. Kyle McNeal and, as the title of the series suggests, the topic of truth plays an important role. The story is told from a variety of perspectives - you get to know good and rather dodgy characters very well. The two most important characters, however, are Whym and Quint. Whym grew up in RatsNest, in a family that once was important but has fallen into disgrace. Quint, on the other hand, is the son of a religious leader and destined to take his place one day. Both young men are not quite happy with their fate. Quint does not believe his father's faith is just. And Whym does not want to continue living in misery, being bullied and destined to be less than other people. An apprenticeship - with an enemy of his family - seems to be the way out of RatsNest. However, his apprenticeship to become a Seeker reveals many new truths to Whym and shows that history is usually written by the victors, who will bend the truth the way they see fit. Quint learns the same about the faith - and both need to find a way to become the men their world needs them to be. Birthrights by J. Kyle McNeal is a lovely, long book. In my opinion, fantasy books NEED to be long so that the world can be introduced, readers can become attached to characters and get to know them fairly well - and a short book usually cannot achieve great world and character building. A good fantasy book draws you into a different world, makes you forget the real world around you, and makes you feel like the world - as fantastic as it may be - could very well be a real world somewhere. J. Kyle McNeal managed to convince me, draw me in, entertain me, and glue me to the pages. I've read hundreds of fantasy books in my many years as a reader - most of them I forgot about as they are just more of the same. While Birthrights obviously gets some pointers from the masters of the genre - and being absolutely innovative is almost impossible these days - the book feels fresh and I wasn't bored at any stage of reading it. The various plots were presented in a masterful way with enough surprises to keep you reading and wondering. Experienced readers will understand when I say it's a book you can get comfortable with, and kind of get attached to. I also enjoyed that the design and editing were obviously well thought through and not just a side thought.